It felt cold, but it could have felt colder. It could have been like it was a few days earlier, when bitter winter winds would have made this a brutal proposition. A bright blue, almost cloudless sky hung above the Quarry Hill trails and the temperature was around 12 degrees. It was a good day to race. This was the day the Colby College Nordic team and the people behind the Quarry Road Recreational Area have waited for. Colby College has hosted ski carnivals before. The downhill competition is at Sugarloaf. 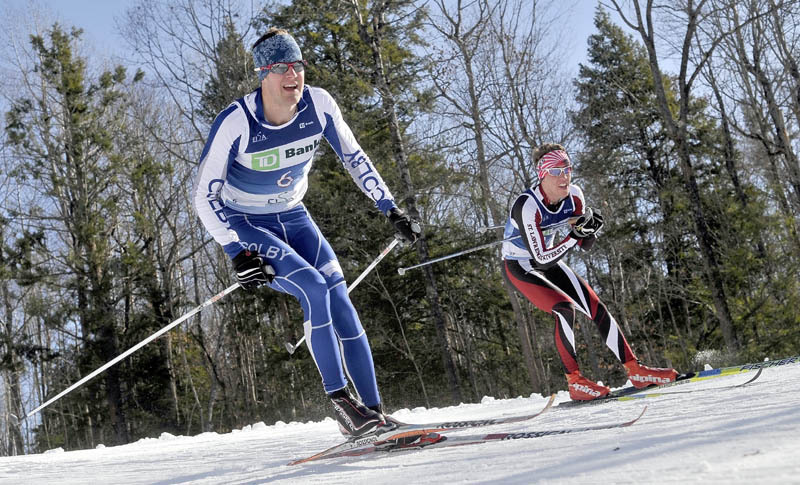 The Nordic races were held at Sugarloaf or Black Mountain in Rumford. With the trails and snow making ability now at the Quarry Road Recreational Area, barely a mile off the Colby campus, the Nordic races can finally be held in Waterville. College ski teams from across the Northeast competed at Quarry Road this weekend. On Saturday, the women competed in a 5-kilometer individual start classic race, while the men raced a 10K. Today, the Colby carnival concludes with a women’s 15K mass start skate race at 9:30 a.m., followed by a men’s 20K race. “It’s amazing. The community joined together to put all this work into it. It’s like a Colby effort, a community effort and now we’re holding really high quality races,” Colby senior Molly Susla said. Susla was the third racer on the course Saturday morning. Susla and her teammates trained at the Quarry Road Recreational Area, but they were new to racing there, just like every competitor. Any home course advantage enjoyed by the Colby skiers was minimal. “The downhills are pretty wild, which is a good thing. It’s twisty and has places where you have to transition a lot. It’s cool,” Susla, who placed 35th out of 103 women, said. Colby senior Jake Barton described the course simply. One downhill in particular grabbed the racer’s attention. Susla held out her right arm and pantomimed a snake slithering as she described the course. “You have to take an S turn. You whip around this one turn and you go right into the other,” Susla said. “It’s a big switchback, and if you’re not careful it will shoot you right off the corner. Everyone here’s a good skier, so I don’t think it was too much of a problem,” Barton, who finished 17th out of 94 men, said. Barton looks at this network of trails and he sees fewer long drives to Carrabassett Valley to train. He looks at the snowmaking capabilities at the Quarry Road Recreational Area and he sees fewer snow training sessions canceled due to lousy conditions. Almost 200 skiers competed in Saturday’s races. The Quarry Road Recreational Area has a top of the line trail system, and it’s not just for large scale Nordic races. Anybody can use them.